Rosa Rubicondior: How Embarrassing! Where Is The Fossil Evidence? Grand Canyon. Where is the Flood fossil layer? No, not that fossil evidence! The fossil evidence for Evolution is abundant for those not too afraid to look for and at it. In fact, every fossil is evidence for it to those who understand what Evolution is and how it works. The fossil evidence I'm asking for is the evidence that would be there if the Bible is a true account of history, and in particular, if the Noah's Ark story really happened as described in Genesis 6-8. This mass extermination would have resulted in a layer of dead animals, with no scavengers to eat them, covered almost immediately by a layer of marine silt as debris from this devastating flood settled out - ideal conditions for fossil formation. These conditions are only rarely replicated under normal circumstances, hence the relative rarity of fossils, especially of terrestrial species. No such problem for the time of the alleged Flood though, so fossils from then would be abundant - if it really happened. A characteristic of this fossil layer would be that it was composed almost exclusively of modern terrestrial animals and that they would not be restricted to areas where these species live nowadays because, in a global flood, the bodies of dead animals would be free to float to anywhere the currents took them. South American species would turn up in Africa, African species in Europe, Asian species in North America, etc. etc. So where is this layer of fossils in the geological column as predicted by the global flood hypothesis? Where would be a good place to look for it? It should be practically everywhere, especially in valley floors where the dead bodies would have accumulated and where the silt layers should be thickest, but every strata deposited during this supposed global flood should contain these fossils near to the bottom of it, together with the fossilised remains of uprooted trees and woods and forests killed by submersion in salt water for over a year. No such silt or fossil layer is found in these places. 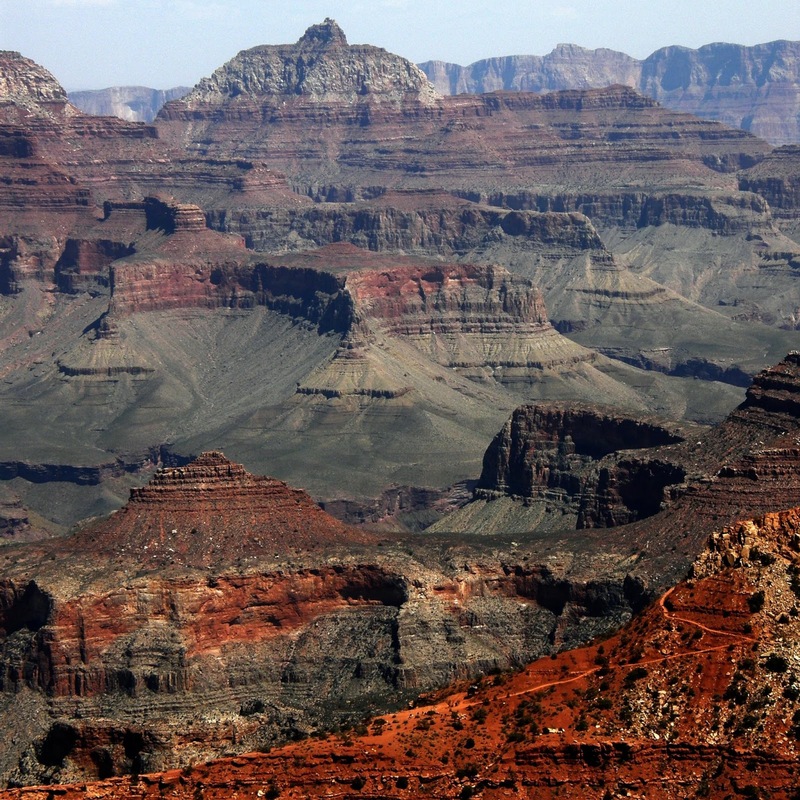 How about we look in Creationists' favourite geological feature - the Grand Canyon? Creationists such as Kent Hovind, Ken Ham and Dwayne Gish insist that, despite the geophysical evidence to the contrary, the Grand Canyon is proof (how easily they throw that term around!) of a global flood, claiming that the strata were laid down during the flood and that the canyon itself was cut by flowing water when all the water then flooding Earth ran off (sic), presumably over the edge, but some got held back by a natural dam which then burst to produce a torrent of water cutting through the flood deposit to form the Grand Canyon. This then is where, if their claim is right, we should find the predicted fossil layer in which modern terrestrial animals from all over the world should be present, if not predominating. It isn't there, of course, because the story isn't true. No wonder Creation 'scientists' always try to convince their victims that Evolution has no supporting fossil evidence when they must be acutely aware that the myth they are pushing as historical fact posits an inevitable, unmistakable and ubiquitous fossil layer, which is quite simply absent. In this case absence of evidence is conclusive evidence of absence, and absence of required evidence falsifies the story. And once again we see that the Bible is not supported by real-world evidence. "but but.. the fossils are made by devil he made false fossils of dinosaurs and millions other to confuse us and he didn't made so for noah to falsify him" ok,then why aren't there millions of bones/skelton,why they aren't found,where are the cities that were flooded?their answer- they were hidden by satan and atheist deliberately to undermine god and cancel our ticket to la la land.this is the logic you will get if these people were going to have any effect from facts it would have happened a long time ago in science even a good working and almost accurate theory is abandoned in favour of better version or alternate theory which could agree with observations,known laws and also make prediction that can be tested and repeated say about light speed etc. if theory is about light propagation but that is not the case with religion despite having thousands of evidence they provide excuse and keep on hallucinating they are not brave thinkers they are scared believers who are afraid of truth they need satan to blame,they need god to create illusion of help,they need heaven to escape death cause.